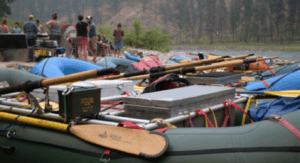 Marie recounts her time on the Main Salmon River Rafting trip with SOAR Northwest and the Idaho Conservation League for the second year in a row. The week long, family rafting trip offered up hard working and likable river guides who did their best to: keep everyone safe, provide tasty meals, enjoy fun white water and find incredible views. Something that made this trip stand out, continues Marie, is that the reason the ICL and Soar Northwest joined together for this rafting trip, was the importance of conserving our wildest places. The Main Salmon River was designated as wild and scenic in 1980 and continues to be a special place where we can glimpse the habitat as pristine and untouched as it is for the variety of wildlife that live there. 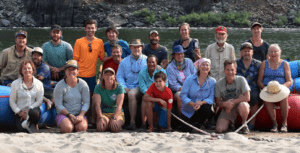 The Main Salmon River Rafting trip, to Marie, answers her questions of “Why is Wilderness Important” with her personal reflections of inner calmness that comes from being around nature, the trees, the mountains, the river. Her daily worries disappear as she spends this important time disconnected from our modern world and is able to calm her mind.